April is new homes month. And one of the virtues of a newly constructed home is the savings that come from reduced energy and maintenance expenses. In a previous analysis, we used data from the 2009 American Housing Survey (AHS) to offer proof. The AHS classifies new construction as homes no more than four years old. 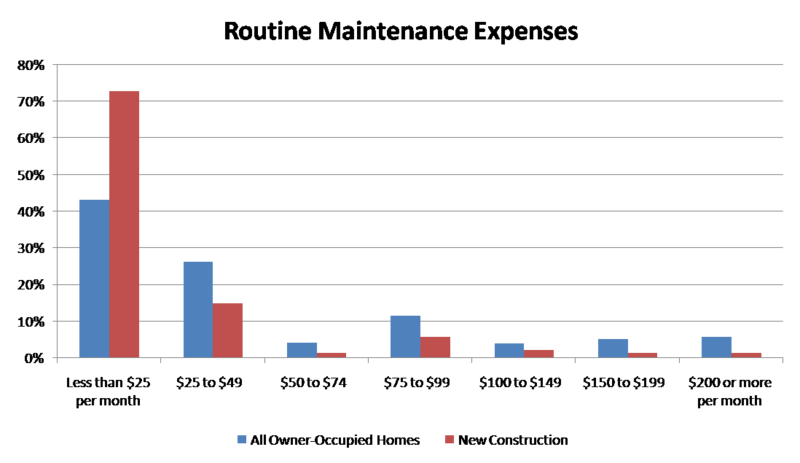 For routine maintenance expenses, 26% of all homeowners spent $100 or more a month on various upkeep costs. However, only 11% of owners of newly constructed homes spent this amount. In fact, 73% of new homeowners spent less than $25 a month on routine maintenance costs. Similar findings are available for energy expenses. According to the 2011 AHS, on a median per square foot basis, homeowners spent 81 cents per square foot per year on electricity. Owners of new homes spent less: 68 cents per square foot per year. For homes with piped gas, homeowners spent on average 50 cents per square foot per year. Owners of new homes spent just 34 cents per square foot per year. 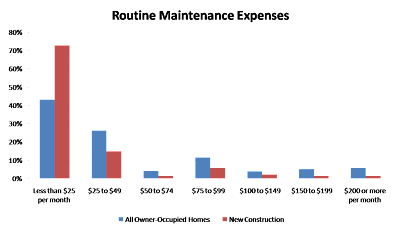 The 2011 data show similar results for various other utilities. For water bills, homeowners averaged 28 cents per square foot per year, while owners of new homes averaged 22 cents. For trash bills, the median for all homeowners was 15 cents per square foot per year, while for new construction the median was 13 cents per square foot per year. These data highlight that a new home offers savings over the life of ownership due to reduced operating costs. And in fact, these reduced costs result in lower insurance bills as well. The median cost for all homeowners of property insurance is 39 cents per square foot, while it is only 31 cents per square foot for owners of new homes. These reduced expenditures represent one of the many reasons that the current system of appraisals needs updating to reflect the flow of benefits that come from features in a new home.